this week has been a week full of ups and downs. we were teaching Mike (the one who has came to church drunk twice) about church. i told him that we loved him and i said... "you cant feel the spirit at church when you're drunk." he pause for a minute...then got up and left the room. you could hear a door slam or something, then he came back and said "ya know i love ya zac, but dont ever come back again." (he saw my first name on my scriptures). We were there with a member...so we got our stuff and left. I knew that he had to be told that...we're told to testify with boldness. but i still felt horrible because i honestly love him. i want him to find the peace that the gospel brings, and i didnt want to give up on him. a couple days later we got a call from him. he wouldnt stop saying how sorry he was, that he was drunk when he said it, and how he hopes he is still welcome at church. we went over there later that night and talked about how addictions can lead us down the path of destruction. hopefully this will lead him to repentance, and overcoming his alcoholism. Elder Rhea and i were tracting the other night on the border of our area. theres a street that is in our area, and in the first ward elder's area as well. and we ran into each other...how crazy is that?! out of the whole city of Lynchburg...two companionships were tracting on the exact same street...i know that the Lord wanted us to find somebody on that street. lol. so that was kind of interesting. There is a cool missionary saying that elder rhea and i like to say...4th floor last door. i testify that is true!! we were tracting the other day and it was dark (not the funnest time to be tracting haha). but thats ok because our other saying is...its fun to find, all the time, espicially from 6-9. Anyways...we said that the end of the block was going to be our last house. we needed to loan out one more copy of the Book Of Mormon to meet our goal. everybody was saying no...and we came to the last house on the block. before i knocked on te door i asked elder rhea if he had enough faith to loan the BoM...because i didnt. He said that he did. We knocked it, the lady was super nice, and we were able to loan her a BoM. I love how the Lord performs tiny miracles every once in a while to let me know that he's still listening. :) this work is real, Heavenly Father listens to us, and He is mindful of our needs. i am so greatful that i know what i know. that He has a plan for each and every one of us, and that he wants us to be happy and return to live with him. i can also testify that i know that to be true. thanks for all your support and prayers. love y'all! "Born again, free from sin, never goin to church again. I beat my kids i beat my wife, im gonna have eternal life"
Well hello family and friends...this week has been another good one. 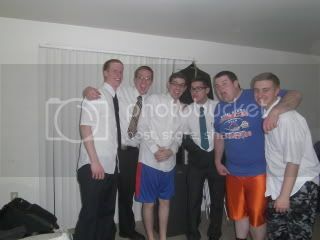 On Firday we had a 24 hour exchange, and i went with Elder Brady in his area. So in the neighborhoods here...there absolutely no sidewalks!..so you have to park in peoples yard. So he parked around the corner on somebodys side lawn. When we came out the car had sunk like 4 inches into the lawn?! We tried getting out, but it wasn't working...ugh. So we finally had to call some members to have them help us push it out. We left a HUGE rutt in their lawn...ugh. It was SO emberassing. Thats just what these baptists want to see...a couple of mormon missionaries ruining their lawn. We had a really good lesson with one of our investigators the other day. When we got there he told us that he had been researching Joseph Smith on the internet (never a good sign)...we asked him what he thought about him. He started to almost yell saying... "he's almost as good a Jesus", "he had a lot of guts", "i love that man". We were so excited to hear him say all of this stuff! He went to prison when he was 19 and was in for eighteen years. But he is loving the gospel so far. As we were praying the member said how we were greatful for Joseph Smith, and Mike (investigator) said "Yes God, i love that dude". haha! :) It was really funny. But its been a pretty good week, i cant believe that this transfer is almost over already... Thanks for all the love and support, i look forward to hearing from y'all. love ya.